← Would This Happen If Your Dog Escaped? Dog Obsessive Behavior – What Can You Do? When dogs exhibit obsessive behavior, you can be sure there’s a good reason. Most often, it relates to a conflict between the dog’s current living conditions and its inherited traits. The bigger the gap between them, the more likely your dog will participate in obsessive actions. You could almost state it as simply as “the dog is bored”. Imagine if you are a person who was born to experience an active lifestyle. Suddenly, you’re put into an environment that limited that activity. You will go through a few stages, from being anxious to accepting your fate to boredom. Boredom brings other activities. For humans, that often is over-eating or obsessively playing video games. Dogs follow a similar path when what they were bred to do never materializes. This is when you will see problem behaviors, such as scratching, being destructive, obsessive licking and biting that causes skin lesions and sores. By inviting the dog into your “humanized” home, you have removed his need to hunt. You have removed his romantic instincts by having him neutered. You are depriving him of his pack interests and competition. He can’t even solve his own problems, because you’ve taken care of everything for him. In exchange for all your “kindness”, he channels his energies in unacceptable ways. Joggers and cyclists are perfect prey to satisfy his hunting instincts. Dogs with high prey drive need predatory outlets. You can do that by involving him in planned events that require him to use those predatory instincts. Seek and find is a great game. You must find ways to stimulate your dog’s mental abilities on a regular basis. Teach him new tricks. Give him the opportunity to mingle with his own kind, like at the dog park. If this doesn’t resolve any obsessive dog behavior, ask your veterinarian as it could be several other things, depending on the behavior. Snapping at imaginary flies could indicate a mental disease like seizures. Perpetual licking and biting his own body can indicate allergies. Or it could simply be a coping strategy resulting from deprivation. In any event, your first goal is to find ways to optimize your dog’s lifestyle. This entry was posted in Problem Behaviors and tagged dog obsessive behavior. Bookmark the permalink. 1 Response to Dog Obsessive Behavior – What Can You Do? Hi Sylvia, it’s Merlyn from the WF. Really enjoyed your blog and shared it on FB. I have a lot of friends who are dog lovers so I think they’ll enjoy it as well. Join Dog Talk Weekly Now! Dog Talk Weekly offers advice, tips, personal stories, fun games and interesting facts for dog owners. Don't miss another issue! Sign up now. It's FREE! Click HERE! to see what you get. Here’s How To Potty Train Your Dog Quickly? Tyler – My Playful Companion is Painfully Missed. 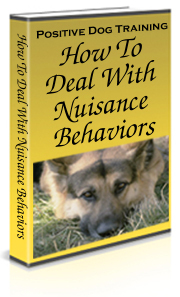 Positive Dog Training: Dealing With Nuisance Behaviors is a handy guide that explains how to work with a dog that just keeps getting into trouble, like a naughty teenager. Click the link to get the details. I enjoyed writing this book because I can relate to so many of the issues it covers. How To Memorialize Your Dog Starting Now! 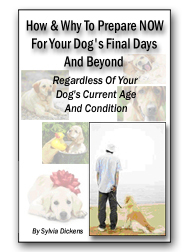 Whether your dog is just a puppy, middle age or in the final years, this short report is for you. It gives you ideas on immortalizing your dog along the way - with valuable insight into euthanasia, how to talk to children about your dog's end of life, and how to handle the grief with your entire family. A must read for every dog owner! How To Prepare Now For Your Dog's End Years and Beyond.